The marine sector consumed about 3.8 million barrels of fuel each day in 2017, which made it responsible for 50 percent of the global demand. The bulk of this fuel was high sulfur fuel oil (HSFO), which produced sulfur emissions of between 1% m/m and 3.5% m/m when consumed by most shipping liners. Getting emission levels to under 0.5% m/m will require a large commitment from the shipping industry. The most direct option is for shippers to switch to low-sulfur fuels like low-sulfur residual fuel oil (LFSO) or low-sulfur distillates (LSD). Big refiners such as ExxonMobil are preparing to produce a large quantity of this type of fuel as IMO 2020 deadline draws near. Shippers could instead continue to use high sulfur fuel oil (HSFO) but install scrubbing equipment to remove sulfur from the exhaust system. Top shipping companies like Maersk will take this approach. The shipping company plans to fit their vessels with sulfur scrubbers to reach compliance by January 2020. Shippers can also use alternative fuels like the liquefied natural gas (LNG) or methanol. However, it’s estimated there will only be enough LNG to cover 10% of the required shipping fuel by 2040. Even though most industry players can expect to increase their costs, one party will benefit massively from this regulation: namely, refiners who are already capable of processing low-sulfur oil. Refineries in China and the U.S. can take advantage of their advanced systems to generate environmentally-friendly and low-sulfur distillates. Big oil refineries in the U.S. Gulf Coast see the opportunity to make more profits from the expected high demand for low sulfur fuels. The same scenario is playing out in Europe with companies like BP, Plc, and Repsol SA working to raise their fuel output to meet the expected demand. The overall shipping capacity will likely remain the same when the IMO deadline arrives. However, some carriers will experience a slight decline in capacity when trying to comply with the new ICO rules. With the looming shortage of low-sulfur fuel and the high cost of converting to a liquefied natural gas (LNG) system, more carriers will install scrubbers to remain compliant with the IMO 2020 rules. 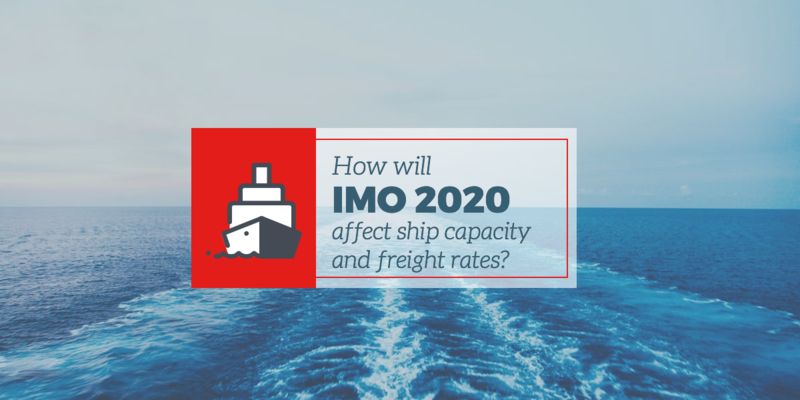 In some cases, the IMO 2020 regulation may actually increase capacity as ship line producers aim to create new eco-friendly vessels to enter the market. New vessels would increase the supply of available capacity and increase fuel efficiency by 30 percent compared to older vessels. While predictions show capacity will remain somewhat stable, freight rates will rise significantly. Staying compliant with these new sulfur laws will cost the liner industry approximately $15 billion. For context, an Asia to North Europe round trip could cost an additional $1 million after the sulfur emission laws take place. It’s important to note that the expected rise in shipping rates is coming high on the heels of the recent attempts by top carriers such as Maersk, CMA, CGM, and MSC to add bunker charges. The bunker surcharges of summer 2018 show just how unprepared shipping liners are for rising fuel rates. The IMO’s low sulfur cap is a game-changer because it affects the entire industry. Factors like the cost of installing scrubbers, the unpreparedness of stakeholders, and the expected shortage of compliant fuel have made freight rates difficult to predict. Even as uncertainties from the IMO low--sulfur rule looms, the best way to ensure your operations run smoothly is working with a qualified, experienced, and committed 3PL firm. At CAI Logistics, we utilize our experience and good relationship with suppliers, haulers, and carriers to ensure that your supply chain runs as expected without interruptions. Learn more about our international shipping services here. Subscribe to our blog to stay up-to-date with the most relevant industry content.